One day, a bear cub finds something strange and wonderful in the forest. When he touches it, it makes a horrible noise. Yet he is drawn back again and again. 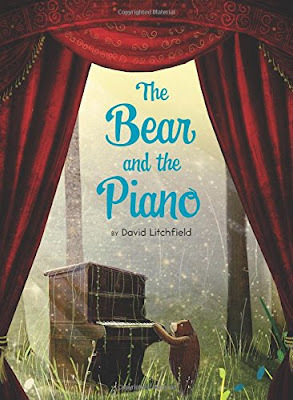 Eventually, he learns to play beautiful sounds, delighting his woodland friends.Then the bear is invited to share his sounds with new friends in the city. He longs to explore the world beyond his home, and to play bigger and better than before. But he knows that if he leaves, the other bears will be very sad. Will he ever see them again? It's beautiful, heartwarming, and endearing. And the illustrations are soft, cozy, and well done. An all-around, feel-good book. But I (sadly) did not love it, like I wanted to. It's a very predictable (overused) storyline that stars (yet again) a bear. Perhaps I'm just bear-ed out (so. many. bear. books.). I don't feel that it had any elements to make it stand out from all the rest. It's perfectly enjoyable so, of course, I recommend it. It's just so standard that I feel like I don't have as much to say. Readalikes include all the (hundreds of—no, thousands!) bear picture books of recent publication. Try The Bear Ate Your Sandwich or Winnie in particular.